The Ironman 150t treadmill from Keys Fitness does have some nice features such as an attractive design and a large running area. Otherwise, they’ve got a long way to go before they can compete with similarly priced competitors’ models made by Precor or Life Fitness. They upgraded the Ironman 150t’s tread belt by installing an "orthopedic belt" that is three times thicker than standard tread belts. That is supposed to help the suspension which in turn helps the wear and tear on your knees and joints. Underneath, the 2.0 HP motor feels a bit small for this heavy (210 lb) folding machine. 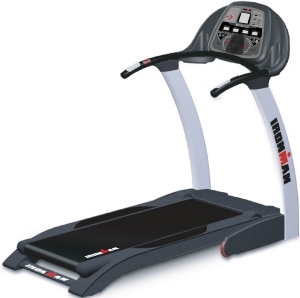 Ask a treadmill expert what he thinks of the Ironman 150t and he’ll give you a so-so reaction. The value will be found in the right price, if you can get it. Owners don’t report major problems with the Ironman 150t and they do love it for its full-size features and good-looking profile. The lower price and stable, solid feel of Ironman treadmills almost ensure users that one of these models will not be underutilized — or worse, left in a corner to collect dust. The Ironman 150t lists for $1299 (online for around $850) and it’s probably a reasonable buy at that price. The overall impression is that, like all Ironman treadmills, it will probably do an above-average job for the light workout. But beginners only need apply here; if it’s more treadmill you need for aggressive workouts, keep looking. We would suggest the same amount of money on a Precor or Life Fitness treadmill which will give you more value for your dollar than the Ironman 150t treadmill.